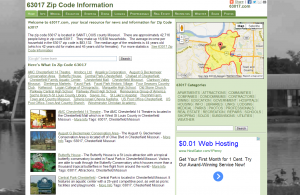 We have hundreds of “Zip Code” Focused Community Sites. What kind of information to do you find on our community sites? Information on local (and nearby) real estate, housing, schools, parks, recreation, entertainment, medical, shopping, dining, professionals, events, utilities and more. These sits are great places for local real estate and insurance professionals to promote their services.